Please refer to our stock # 1756 when inquiring. 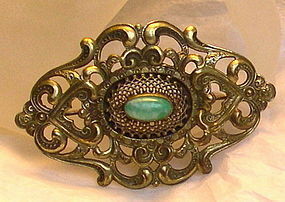 Circa 1900 sash ornament that can be worn as brooch pin with wide "C" catch. The green 14mm oval art glass mottled stone, made to resemble apple green jade and referred to as Chinese peking glass, is bezel set amidst a lattice dome and highly ornate designs. You should see the globules within which is what makes this a very collectible simulated stone. Substantial @ 3" x 2" & weighs 21 grams. $11 USPS Priority/Ins/Track or Free with USA Ck or USPS MO.